Traffic Portal is the official Traffic Control UI. Traffic Portal typically runs on a different machine than Traffic Ops, and works by using the Traffic Ops API. The following high-level items are available in the Traffic Portal menu. The Dashboard is the default landing page for Traffic Portal. It provides a real-time view into the main performance indicators of the CDNs managed by Traffic Control. It also displays various statistics about the overall health of your CDN. The current bandwidth of all of your CDNs. The current number of connections to all of your CDNs. Displays the number of healthy caches across all CDNs. Click the link to view the healthy caches on the cache stats page. Displays the number of unhealthy caches across all CDNs. Click the link to view the unhealthy caches on the cache stats page. Displays the number of cache server s with ONLINE status. Traffic Monitor will not monitor the state of ONLINE servers . Displays the number of cache server s with REPORTED status . Displays the number of cache server s with OFFLINE status . Displays the number of caches with ADMIN_DOWN status . Each component of this view is updated on the intervals defined in the traffic_portal_properties.json configuration file. (1, 2, 3, 4) For more information, see Health Protocol. ‘true’ if DNSSEC is enabled on this CDN, ‘false’ otherwise. The Monitor section of Traffic Portal is used to display statistics regarding the various cache server s within all CDNs visible to the user. It retrieves this information through the Traffic Ops API from Traffic Monitor instances. A real-time view into the status of each cache. The Monitor ‣ Cache Checks page is intended to give an overview of the caches managed by Traffic Control as well as their status. Operational Readiness Test - uses the ORT script on the Edge-tier and Mid-tier cache server s to determine if the configuration in Traffic Ops matches the configuration on the Edge-tier or Mid-tier. The user as whom this script runs must have an SSH key on the Edge-tier servers. A table showing the results of the periodic Check Extensions that are run. 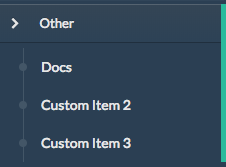 These can be grouped by Cache Group and/or Profile. Services groups the functionality to modify Delivery Services - for those users with the necessary permissions - or make Requests for such changes - for uses without necessary permissions. If enabled in the traffic_portal_properties.json configuration file, all Delivery Service changes (create, update and delete) are captured as a Delivery Service Request and must be reviewed before fulfillment/deployment. Interfaces for managing the various components of Traffic Control and how they interact are grouped under Configure. The CDN to which this Profile is restricted. To use the same Profile across multiple CDNs, clone the Profile and change the clone’s CDN field. 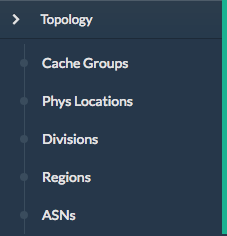 Topology groups views and functionality that deal with how CDNs and their Traffic Control components are grouped and distributed, both on a logical level as well as a physical level. Tools contains various tools that don’t directly relate to manipulating Traffic Control components or their groupings. Generates a boot-able system image for any of the servers in the Servers table (or any server for that matter). Currently it only supports CentOS 7, but if you’re brave and pure of heart you MIGHT be able to get it to work with other Unix-like Operating Systems. 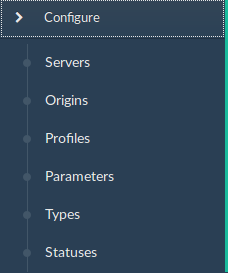 The interface is mostly self-explanatory, but here is a short explanation of the fields in that form. If this is ‘yes’, then the download will start immediately as the ISO is written directly to the socket connection to Traffic Ops. If this is ‘no’, then the download will begin only after the ISO has finished being generated. For almost all use cases, this should be ‘yes’. 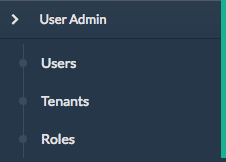 This section offers administrative functionality for users and their permissions. The parent of this Tenant. The default is the ‘root’ Tenant, which has no users. Custom menu items. By default, this contains only a link to the Traffic Control documentation. This is just a link to the Traffic Control Documentation. This section is configurable in the traffic_portal_properties.json configuration file, in the customMenu section.